In extreme cases, the PCA framework provides the RBI with powers to force mergers or even wind up the non-compliant banks. of India (RBI) in the face of worsening financial ratios. Net non-performing assets (NPAs) of these banks have overshot the limit set by the central bank. 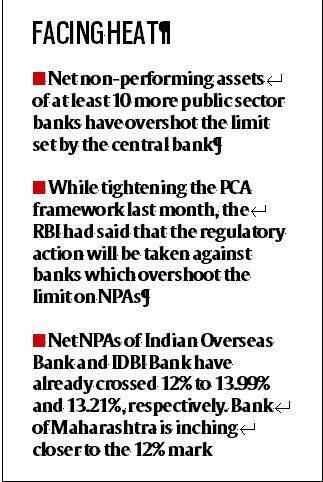 While tightening the PCA framework last month, the RBI had said that the regulatory action will be taken against banks which overshoot the limit on NPAs or fail to comply with capital ratios. Action under PCA can include curbs on expansion, exposure and dividend payment. In extreme cases, the PCA framework provides the RBI with powers to force mergers or even wind up the non-compliant banks. On bad loan ratios, the central bank said that the first threshold will be triggered if a bank’s net NPA ratio crosses six per cent. A net bad loan ratio of more than 12 per cent and the fall in Common Equity Tier-1 (CET1) capital below the limit will invite the extreme action of winding up or merger. Net NPAs of Indian Overseas Bank and IDBI Bank have already crossed 12 per cent to 13.99 per cent and 13.21 per cent, respectively. Bank of Maharashtra is inching closer to the 12-per cent mark. Its net NPAs were 11.76 per cent for the quarter ended March 2017. Net NPAs of Central Bank of India were 10.20 per cent, compared with 8.54 per cent previously. Dena Bank’s net NPAs were 10.66 per cent and United Bank of India’s 10.02 per cent. The RBI has already invoked PCA framework on IDBI Bank because of its rising bad loans and negative return on assets. In the year ended March 31, 2017, the bank posted a net loss of Rs 5,158 crore, compared with a net loss of Rs 3,665 crore in fiscal 2016. The bank’s gross NPAs almost doubled to 21.25 per cent of the gross advances in the fourth quarter of the last fiscal. The central bank also initiated PCA against UCO Bank earlier this month. In October 2015, the RBI had initiated PCA against IOB, but there was hardly any noticeable improvement in its financials. While its net NPAs remain above 12 per cent, the bank reported a net loss of Rs 646.66 crore in the March quarter, its seventh consecutive loss-making quarter. Bank of Maharashtra’s net NPAs shot up to 11.76 per cent, compared with 10.67 per cent in the previous quarter and 6.35 per cent in the same quarter last year. The bank also reported a net loss of Rs 455.45 crore in the March quarter — fifth consecutive quarterly loss — on steep increase in bad loan provisions. However, Punjab National Bank (PNB) has slightly improved its ratio from 9.09 per cent to 7.81 per cent. Bank of India net NPAs also improved marginally to 6.90 per cent. Corporation Bank (8.33 per cent) and Andhra Bank (7.57 per cent) deteriorated during the March 2017 quarter. According to the RBI norms, regulatory action will be taken if a bank’s capital-to-risk assets ratio falls below 7.75 per cent. If the ratio falls below 3.625 per cent, the bank could be a candidate for a merger or might even be wound up. If CET1 capital falls below 5.125 per cent and net NPAs are between nine and 12 per cent, the RBI will slap restrictions on dividend payment, remittances of profits and branch expansion. The promoter then will have to bring in more capital and the bank will have to make high provisioning. “This year, we will not open any branches and will merge the ones in close vicinity… There will no fresh headcount,” Dena Bank chairman and managing director Ashwani Kumar had said while announcing results. “We will look at aggressive recovery and cost cutting measures and plan on churning our corporate book and risk weighted assets which should also ease the pressure on capital,” said IDBI Bank MD and CEO Mahesh Kumar Jain. Once the PCA is activated, the RBI will advise the bank’s board to activate the recovery plan that has been duly approved by the supervisor, undertake a detailed review of business model in terms of sustainability of the business model, profitability of business lines and activities, medium- and long-term viability and balance sheet projections. It will also review medium-term business plans, identify achievable targets and set concrete milestones for progress and achievement and undertake restructuring of operations as appropriate. Governance-related actions of the RBI could include recommending the government or promoters to bring in new management/ board, removal of managerial persons and supersession of the board. The corrective action can include reduction in exposure to high-risk sectors to conserve capital and restrictions on increasing stake in subsidiaries and other group companies, said an official of a bank. “The RBI is likely to take a view on PCA after considering the new NPA resolution measures announced recently,” he said. “More than half of state-owned banks would breach at least one of the new thresholds, mainly owing to high NPAs, based on their latest financial reports,” rating agency Fitch said. The rules suggest “greater willingness” to take regulatory action to address problems at struggling banks, but “implementation is only likely to be effective if it is matched by credible plans to address banks’ significant asset quality issues and capital shortages”, it said. PCA was previously viewed as “an extraordinary step” which the central bank avoided but the same is set to change now. 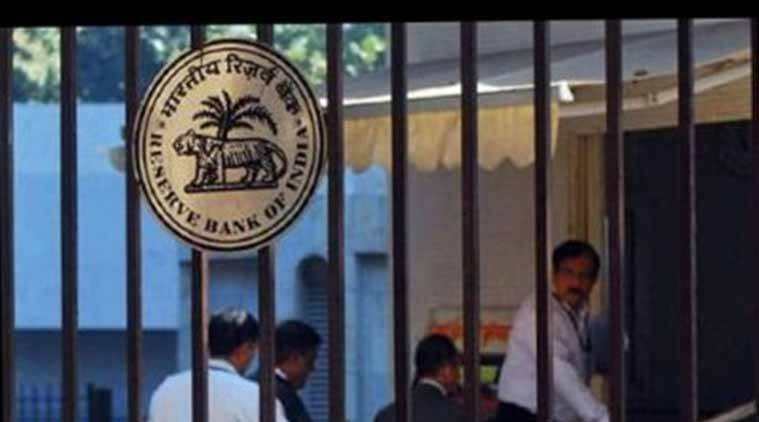 “Under the previous framework, the RBI’s powers were restricted to bank lending but the scope for possible regulatory actions has been broadened under the amended framework. But it remains uncertain to what extent the RBI will use the tools it has just made available,” Fitch said.